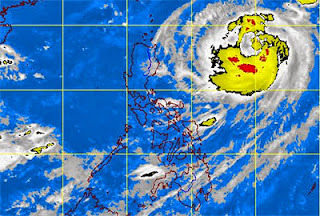 Tropical Storm Quedan continues moving northward and maintained its strength as of 5 am, Wednesday, October 2, 2013, reported by state weather bureau - PAGASA. PAGASA posted on its website,"the center of Tropical Storm "QUEDAN" was estimated based on all available data at 880 km East of Tuguegarao City, with maximum sustained winds of 85 kph near the center and gustiness of up to 100 kph. It forecast to move North at 17kph." PAGASA said, Tropical Storm Quedan (with international name Fitow) is expected to exit PAR on Saturday. PAGASA forecaster Samuel Duran said in an interview on dzBB radio, "Kung hindi magbago ng direction at bilis, inaasahan natin by Saturday lalabas ito ng PAR." PAGASA added that Metro Manila and the rest of Luzon will have partly cloudy to cloudy skies with isolated rain showers or thunderstorms. For the meantime, please bookmark this page now or visit this site more often for you to be updated. You may also share this post to your friends so they may know about Tropical Storm Quedan Update. Comments or suggestions about "Tropical Storm Quedan Update as of October 2, 2013 - PAGASA" is important to us, you may share it by using the comment box below.